One of my favorite debuts of 2012 was Black Hogg, the freshman effort from newcomers Eric Park and Jonathan Kim. Chef Park's generous, robust, and undeniably satisfying cooking impressed me, and since the restaurant reopened with a liquor license last November, I figured that it was time for a revisit, to see how the place was holding up a year in. The interior space has been subtly updated. You'll notice the more prominent bar (replete with beer taps), a slightly smaller dining area, and, of course, the new bathrooms to the left (a requirement for the liquor license I'm told). 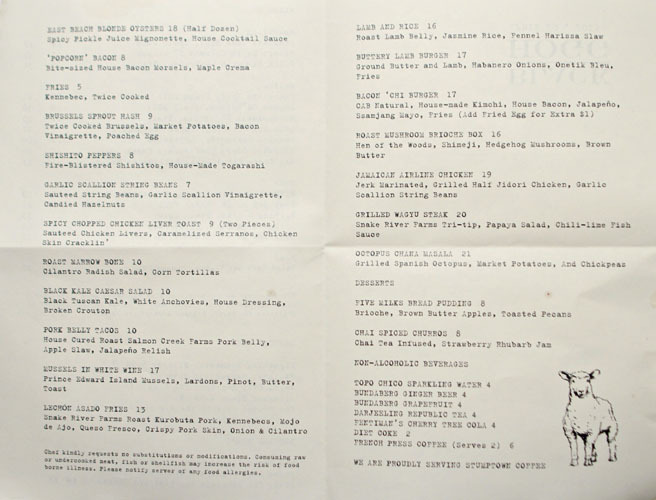 The current Black Hogg menu reads similarly to what Chef Park was offering up before. 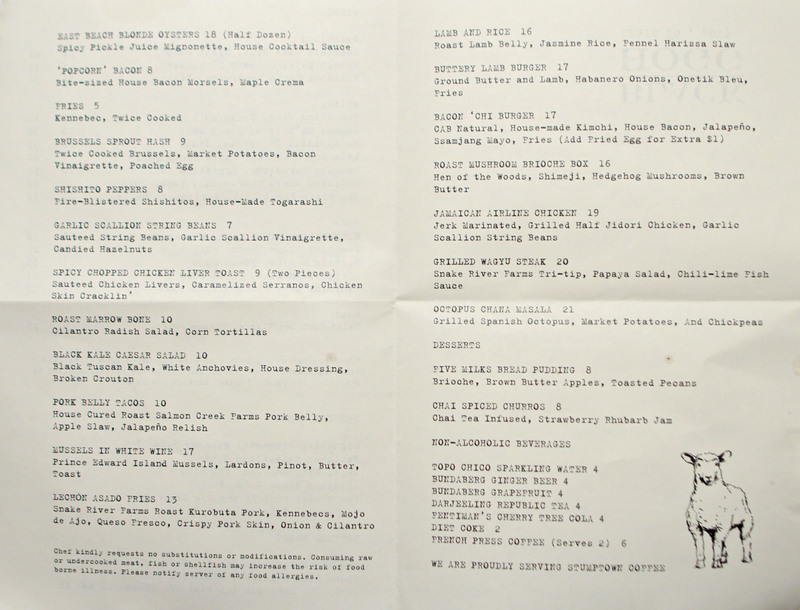 A few of the signatures (the lamb burger, the popcorn bacon, the tacos) remain, while new dishes make up the balance. 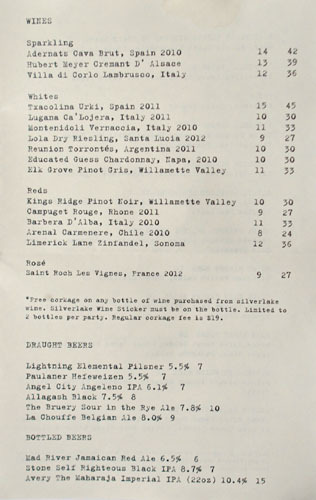 The bigger news concerns the booze selection, which is composed of a focused, smart, reasonably-priced list of wines and beers. Click for larger versions. As with my first visit, I decided to bring along a few bottles of beer from my stash, this time featuring some esoteric European selections. 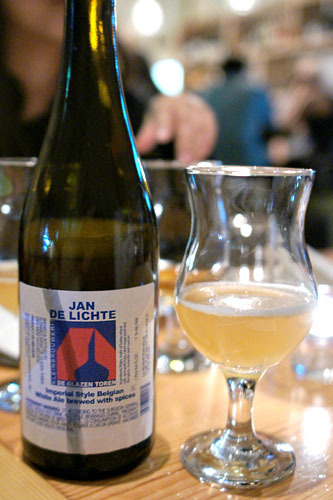 The first was the De Glazen Toren Jan De Lichte, a lovely, though not entirely prototypical example of the Belgian witbier style. The beer was light and utterly refreshing, a model of dry, crisp flavors that blended spice, herbs, and citrus in harmonious fashion. 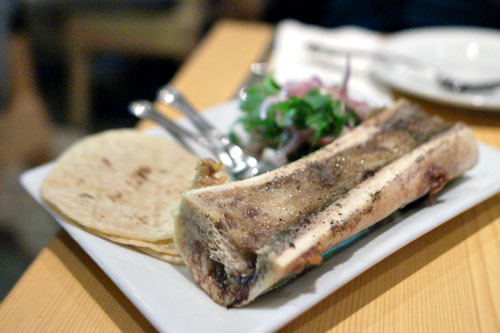 The bone marrow was pretty ridiculous, as in ridiculously good. I have no doubt that it was either the best or second best I'd ever had (with the other contender being Bryant Ng's transcendent sambal'd version at Spice Table). The marrow itself was slippery and trembling to the touch, an expert presentation of the ingredient that was flawlessly counteracted by the combination of radish, cilantro, and onion. Set into a soft tortilla, the whole experience was like eating the best taco you've ever had, a perfect mélange of fat, acid, and crunch. Brussels were a must-try, naturally, and didn't let me down. I loved the texture on these--still slightly crunchy--as well as their savory char, amplified by the bacon dressing. 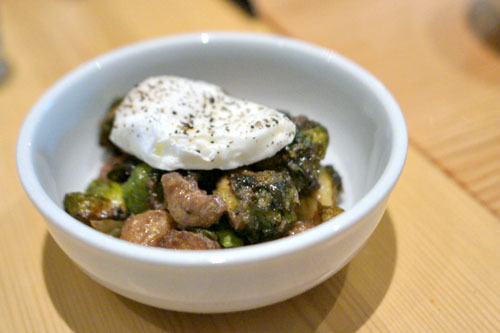 Potatoes added a bit of a moderating element to the dish, while a poached egg just makes everything better. 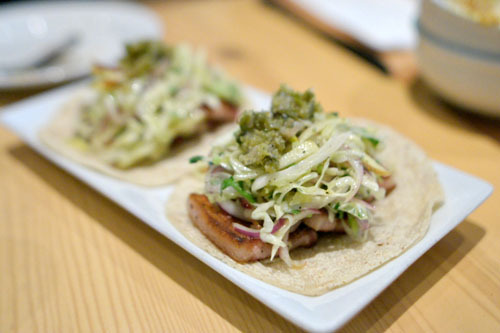 Speaking of the best taco you've ever had, this is pretty much it for me, as far as non-traditional preparations go. It was a perfect dish really, with the fatty, yet crisp rectangles of belly melding beautifully with the countervailing crispness of cabbage, red onion, and apple, all while the jalapeño offered up an undercurrent of heat to things. My second beer was an Italian, the Birrificio Italiano Fleurette Gioia Di Vivere, brewed with roses, violets, elderberry, citrus honey, and black pepper. Pretty cool--I tasted the advertised floral nuances up front, which then transitioned quickly and powerfully to the sugary smack of honey, all while a base of sourness prevailed. 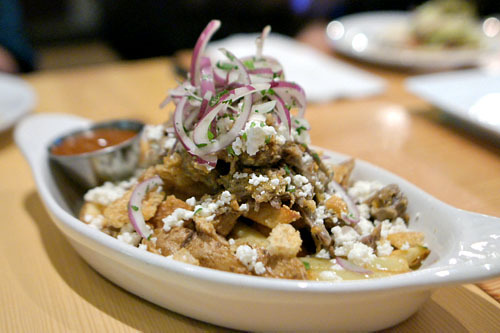 Park utilized lechón to good effect here, producing what's basically like the best carne asada fries you've ever had. The pork displayed a delightful crispness to it, along with a rather profound, earthy savor that paired wonderfully with the queso, all while the onion-cilantro combo added a much-needed brightness to the fray. Topping things off was the mojo de ajo, a piquant, spicy condiment that served as the proverbial icing on the pastel. An inherently slutty dish, made a bit more classy. The first appearance of the namesake hogg was similarly delicious, and uppity version of the famous halal chicken/lamb and rice perhaps? The lamb itself was pretty insane, an in-your-face blast of ovine goodness rendered in fat and lean. I loved how the rice here tempered the sheer intensity of the meat, while the creamy white sauce enveloped and integrated everything. The best part, though, was that fantastic slaw, which imparted a perfectly-placed crunch and acidity to the course. 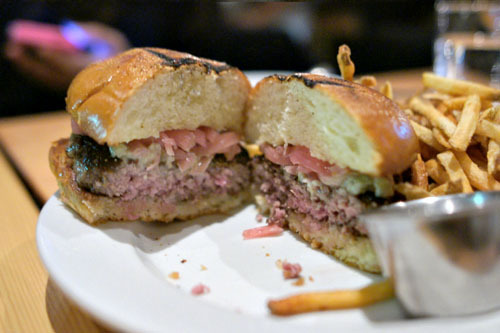 Park's signature lamburger is one of my favorite ones in the City. The crux here is the patty, which really is on the buttery side. Rich and flavorful, with a good char, it folded in the blue cheese seamlessly, while the onions added a jolt of acidity and crunch to the mix. 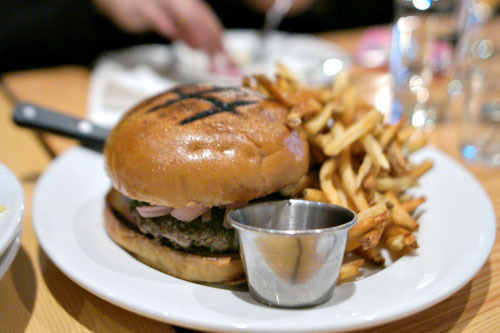 The French fires, not surprisingly, were spot on too, a natural accompaniment to the burger. 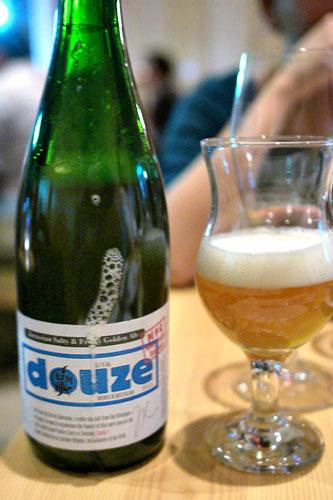 Last up was the Brasserie Des Franches-Montagnes (BFM) Douze, a beer from Switzerland that was brewed with the addition of fleur de sel de Guérande. 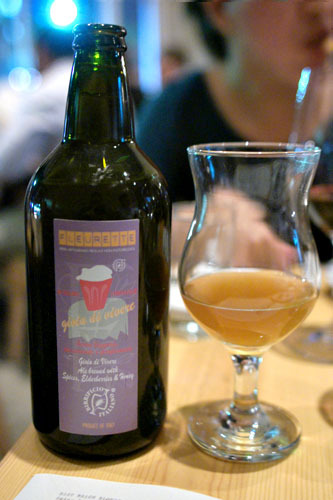 There were some herby, fruity, and yeasty notes that weren't unexpected, but the use of salt added a distinct savory undercurrent in the beer that was hard to describe. I don't think I've had anything quite like it before. Chicken arrived tender and positively succulent, with the sweet, spicy, smoky jerk seasoning adding multiple facets of flavor to the bird. 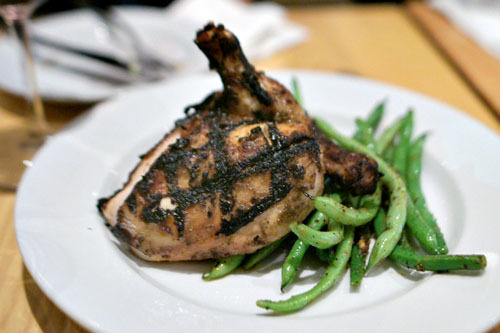 The green beans were on point as well, with a delightfully squeaky bite to 'em and a great garlicky flair. In our final savory course, Chef Park riffed on the classic Indian dish of chana masala, pairing it with octopus. Indeed, the cephalopod was dutifully prepared to a tender, yet still satisfying consistency, with a delightful char component as well. 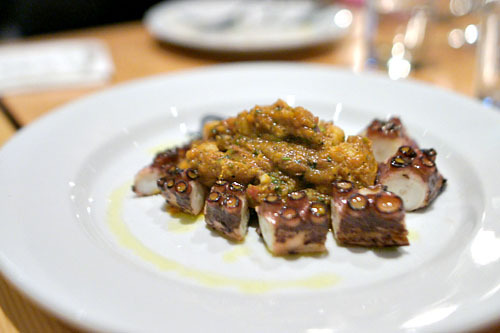 Its pairing with the chickpea mash was surprising, yet successful, imparting the octopus with a myriad of spicy, savory, and sour nuances that definitely clicked. Based on this, I wouldn't mind seeing the kitchen explore more in terms of Indian-inflected dishes--aloo tikki anyone? Our sole dessert (we were burstingly full by this point) comprised Park's interpretation of bread pudding. It may not have been much to look at, but boy did it deliver on taste. 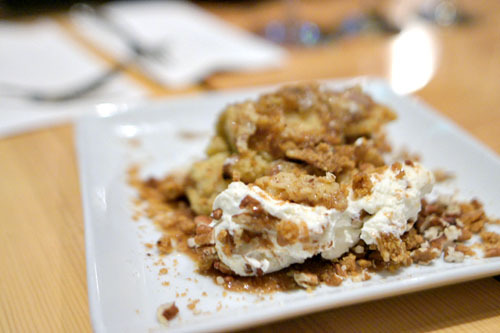 In fact, it was without a doubt one of the strongest bread puddings I've eaten, conveying a perfect blend of sweet, spicy, and nutty flavors, all deftly tempered by a dollop of fluffy cream. I just wanted to keep going, despite my fullness. On my first visit, I found myself rather enamored with Park's lusty, meat-heavy, and most importantly, uncompromisingly delicious cooking, and that sentiment remains. In fact, the food is probably even stronger today, a deft blend of in-your-face brashness and unflappable balance that's even better now that you can get booze. It might just be the best dining option in Silver Lake at the moment, and is surely worth a visit (especially now that they're offering reservations), so go. After dinner at Black Hogg, we went up the street to pay a visit to the inimitable Matt Biancaniello, who's now tending bar at Cliff's Edge on Wednesdays. 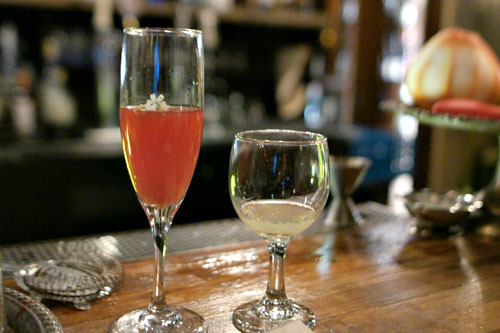 He started us off with a bit of his punch, a scarlet concoction comprised of gin, lemon, housemade Bergamotcello (pictured separately to the right), Champagne, and blood orange. We picked up on the perfume-y, tea-like essence of the drink right away, an intoxicating fragrance that paired just swimmingly with the gin and sparkling wine. 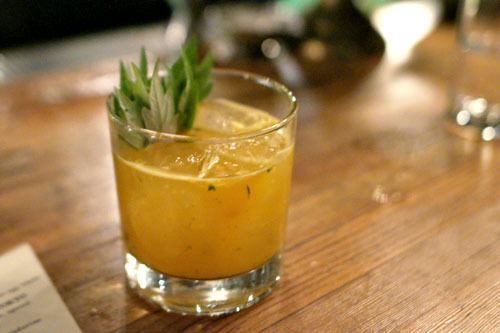 A fun, quaffable cocktail, but with a palpable complexity and substance. 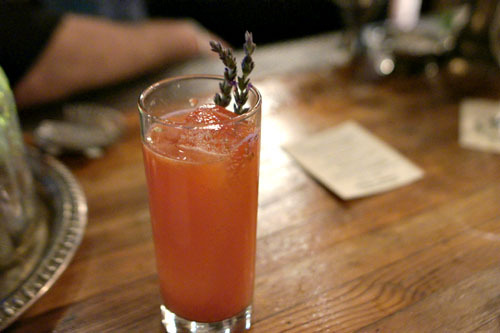 Biancaniello then served up an off-menu drink made with Surinam cherries, lavender, lime, agave, and Hendrick's. This one was also to my liking, a juicy expression of sweet and tart that flowed seamlessly between the flavors of gin and agave, all while the sprig of lavender contributed wonderfully fragrant overtones to the cocktail. We ended with the Hanky Panky, a blend of Bols genever, lovage, paige mandarins, Aperol, and ghost pepper salt that I'd actually had before at one of Roberto Cortez's dinners. This is a cocktail that's definitely not for everybody. The flavors were unapologetically forward, a blast of savory, spicy, and astringent nuances that danced on the palate with the sweet citrus and aromatic jenever influences. Looks like great stuff. Kevin I was wondering where your favorite places to get beer are? Those three sound really interesting. how do you make enough money to afford this? Was also wondering you get your beers from...certainly not Bevmo/Total Wine right? 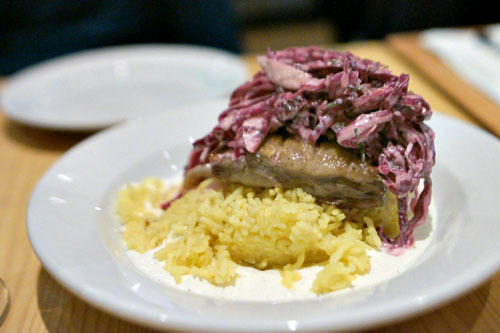 Can you believe that Besha Rodell doesn't even include the Black Hogg in her recent article for the LA Weekly on Silverlake's 10 best restaurants!?! I read her initial review "Black Hogg Down" last year and was shocked how she trashed Chef Park and his food. Anyway, another great review. I love your site. 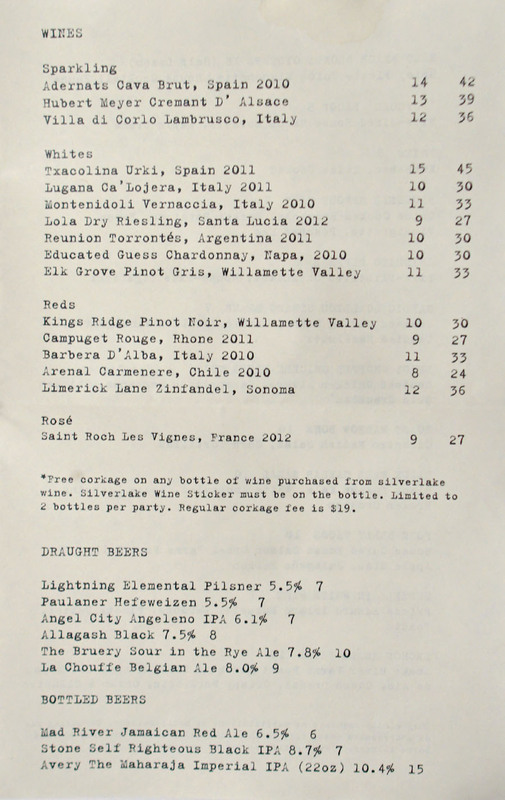 Is there a corkage fee for beers? Terrific write up Kevin. Always enjoy your reviews. Anon: Locally, I generally go to Icon Beverages in Cypress or its sister store, California Heights Market in Long Beach. Online, look toward sites such as Gary's Wine & Marketplace, KNS Wine, Luekens Big Town Liquors, Sunset Corners, and West Lakeview Liquors. Anon: Afford what? Black Hogg is very reasonably priced. Anon: Please see the first question. I do make the occasional BevMo trip, though not for the really interesting stuff. Cary: Thanks. I am indeed surprised that Black Hogg wasn't included. Certainly, I don't expect it to top the list, but its omission did seem odd. Anon: There is, though I don't recall what it was (there was no corkage tonight). I'd call the place to make sure.